Gone are the days when school principals were defined by the number of keys on their key chains. Today's school leaders are judged by their impact on student learning. Such is the focus of University of Louisiana at Lafayette's new master's program in Educational Leadership. Roberts and his UL Lafayette colleagues were among a team of Louisiana professors who helped change Louisiana's method of preparing its school leaders, an approach now heralded nationwide. Working initially with other southern states and then with the Board of Regents and Louisiana's Blue Ribbon Commission on Educational Excellence, UL Lafayette College of Education faculty collaborated with local school districts to revamp the university's graduate program for prospective principals, identify teacher leaders who would be effective at running schools, and infuse them with the knowledge and real-world experience they need to do the job. The result has been graduates who are prepared to step into the job when they emerge from the program, education experts said. “ A healthy future for Louisiana is directly dependent on an excellent work force. An excellent work force is dependent on good schools and good schools require excellent leaders. So this entire initiative is nothing short of focusing directly on enabling a promising future for Louisiana,” said UL Lafayette's Vice President for Academic Affairs Steve Landry. In response to Louisiana's need for professionals in critical shortage areas, including education, the University of Louisiana System Board, presidents, and eight universities, of which UL Lafayette is a part, have pledged to produce an additional 2,400 new graduates per year by 2012 in education, business, engineering and health care. Governor Bobby Jindal has made strengthening Louisiana's work force a top priority of his administration. UL Lafayette and Louisiana are now considered models of school leader preparation. The Southern Regional Education Board, which guides education policy for 16 Southern states, reported that Louisiana was the only state that improved its leadership development processes in all key areas since 2002. UL Lafayette faculty members are invited to states throughout the country to present information about their program and the state's criteria. “ People are looking to Louisiana. The state is highlighted at many Wallace Foundation meetings and Louisiana representatives are invited to serve on national programs. Education Week even did a big spread on them,” said SREB Learning-centered Leadership Program Director Kathy O'Neill. The progress has moved beyond just UL Lafayette and sister institutions to the entire state. “What's happened is that there has been an expansion of these islands of excellence to what is now a state of excellence,” she said. 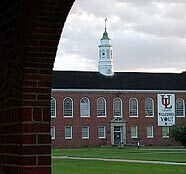 Among the exemplary aspects of UL Lafayette's program she cited is the way the faculty has partnered with school districts in the development of the program. She also credited the university with providing top mentors and with continuously adjusting the program based on feedback from school districts, participants and others. Louisiana implemented its education reforms in a systemic way, impacting every aspect of the education system -- standards, curriculum, testing, accountability, teaching quality and school leadership redesign, something O'Neill said is essential. UL Lafayette has implemented changes to its teacher preparation program as well as its leadership program in response to state reforms and direction by the UL System. Among other things, UL Lafayette guarantees to re-train a new teacher at the university's expense if the school district does not feel he or she is prepared. Teacher preparation programs are important in shaping the school leaders of the future. UL Lafayette participates in a Wallace Foundation grant to develop leadership skills in teachers, said Janet Hiatt, a 17-year veteran principal and now Director of Schools in Lafayette Parish. “ The whole leadership team at the school is so important. It's a collaborative effort. You have to have someone trained and knowledgeable at the head of the team. That's the principal. But teachers have such ideas and knowledge that are research based and based on the needs of that school. That's why they have to work together,” she said. Helping principal candidates to understand the data about student achievement in their school is an important aspect of the program, Hiatt continued. Roberts agrees and says it's a critical shift that leaders must make if they are to meet the expectations of the state and school districts. They load candidates with data and help them to dissect it. “ Most of the program is geared toward data decision making. In the past, someone might have said, ‘We have poor kids and need help with reading.’ The response would often be, ‘How do you know?’ Now, they have the data and have something to back it up,” he said. For more information about UL Lafayette leadership programs, visit http://www.coe.louisiana.edu/.